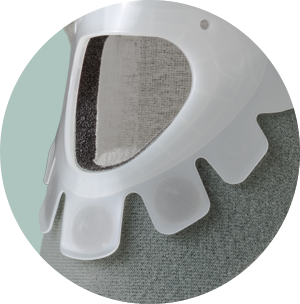 Aspen® Cervical Collars were designed to optimize support and comfort, two key components for better patient outcomes. 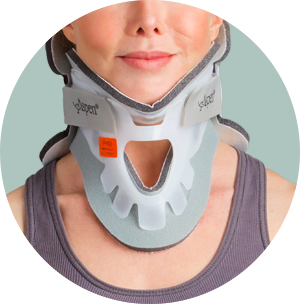 The structure of the collar is engineered to provide substantial motion restriction without producing painful pressure points that can lead to skin breakdown or poor patient compliance. For ultimate comfort, all of the collar's contact surfaces are cushioned with cotton-lined, breathable foam padding. The motion restriction provided by the Aspen Collar has been scientifically evaluated. Utilizing fluoroscopy, researchers have documented both the translation and angulation of each vertebral segment through the entire range of motion. Aspen Cervical Collars is designed to help minimize skin breakdown while providing motion restriction. The structural elements of the collar have been designed to spread support across broad contact surfaces thereby minimizing hot-spots that can cause decubitus ulcers. 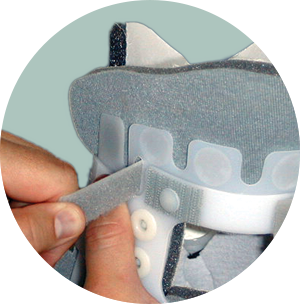 Aspen’s unique Cushion Flex Tabs™ allow the collar to conform to each patient as it is tightened for a custom fit. Tightening the Occipital Support Strap™ further customizes the collar by creating an adjustable, three-dimensional “shelf” that cradles the back of the head. 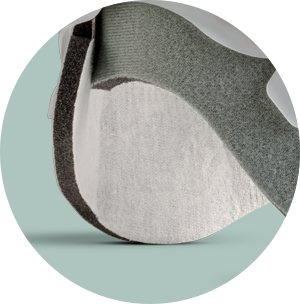 Aspen collar pads are designed to enhance comfort and integrate with skin care protocols. Dense, clickable foam offers extra cushioning to help defend against skin breakdown. Comfort is further enhanced by hypoallergenic, cotton-lined replacement pads that cushion the interface between the “structure” of the collar and the tender skin surface of patients. This attention to comfort helps promote improved patient compliance.